When shopping for a set of headlight bulbs for your vehicle, if you’re trying to go the extra mile in terms of visibility, going with either an LED headlight kit, or an Xenon HID headlight kit will be perfect. In this guide, we’re going to cover the LED route and why taking it may be better than standard halogen, high-intensity halogens, and xenon HID’s. LED car headlights are by far the least commonly used types of headlight lighting, primarily because of the them being a relatively recent style. LED’s by themselves don’t produce much heat, so there’s hardly every a time when they can ruin your headlight housing. Unlike with Xenon and Halogen types of headlight bulbs, LED’s light up instantly and don’t have to warm up. LED headlight bulbs light up and can make precisely cut area of where they shine into (unlike with halogen where the light is bright in the center, but faded around the sides). Not many LED headlight kits or restoration kits are on the market available to buy, but the ones that are available are often times hard to decipher the good from bad. We’re going to take all the guesswork out of it for you. Right below is a list of the 6 best-performing LED headlights for cars, trucks, vans and suv’s. Keep in mind that these are just our opinion based on the thorough research we’ve done, take it more for reference than anything. Plug-N-Play: FluxBeam LED headlights are made to replace nearly all stock housing and sockets, Redesigned inside and out to take advantage of the ARC-LENZ LED Bulb Chipset. Our number 6 contestant is LED Import USA’s LED headlight kit. Although popularly known for making nonautomotive LED lights, their current only product that is created specifically for automobiles. This kit comes in at 6000K (about 7,200 lumens) pure white light, which is exactly the kind of color you’d expect from an LED light. Operating from 60watts of power, these get pretty hot without their heatsinks. Along with the heatsink, each LED light has its own cooling fan which can help them last to over 50,000 hours of constant power. Just in case, these heatsinks and fans are completely waterproof, rainproof, and work in extreme weather conditions. You can choose different fits and style from 9005 H3B, 9006 HB4, H1, H7 and H11 H9 H8. Lastly is the installation, which doesn’t take more than 20 minutes of your time. After installation, if you had any type of halogen headlight bulbs prior, you’ll notice an INSTANT difference. Xenon-Visions 80W LED headlight kit takes our #5 spot for the best LED car headlight bulbs to get. 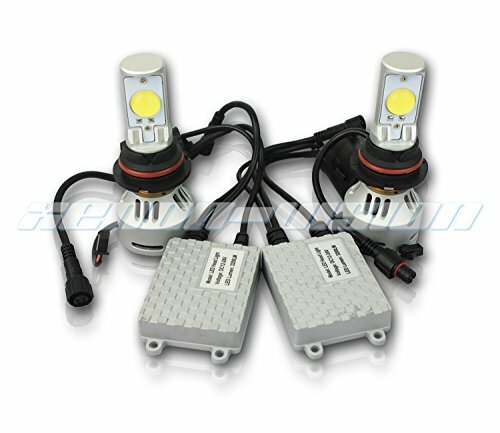 Coming in as a pair of two, these LED lights fit a wide range of vehicles, sizes include: 9004 (HB1), 9005 (HB3/9011), 9006 (HB4/9012), 9007 (HB5), H10 (9140/9145), H11 (H8/H9/H11B), H13 (9008), H4 (9003/HB2), H7 and P13W (PSX26W). The 6500K light output makes a pleasant white light, sharp around the corners letting you know its LED. The Power supply runs on 80 watts using the built-in heatsinks and cooling fans in order to keep the back of these bulbs in operating temperature. The 6500K light output makes a pleasant white light, sharp around the corners letting you know its LED. The Power supply runs on 80 watts using the built-in heatsinks and cooling fans in order to keep the back of these bulbs in operating temperature. The bulbs themselves do NOT get hot at all, but it’s rather the rear end where the power is being input that does. Lifespan should be around 30,000 hours when all the electronic components are running properly. To further ensure durability, each bulb and the electronic components are 100% water proof, and temperature proof. You’ll be able to tell a significant difference when you switch from any type of halogen headlights. 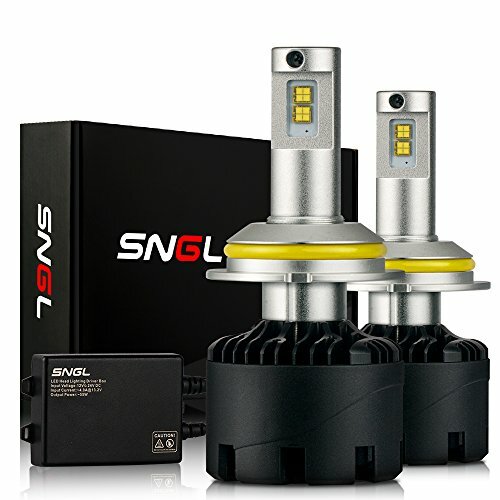 The most expensive set of LED headlights, the SNGL Super Bright LED headlight bulb set is no cheap kit. It’s not cheap in terms of built quality either, especially when you consider the electronics being submerged in water and being able to operate just fine. That’s right, these LED lights are 100% weather proof and water proof. Producing approximately 6000K of pure white light output, these won’t get hot at all at the headlight level. With the cooling fans and heatsinks, they are capable of running constantly without any issues (over 50,000 hours of constant running time). In as little as 2o minutes time, you can install these in a WIDE variety of vehicles, there’s so many fits: H11 (H8, H9), D1/D2/D3/D4 (for 45 and 55W), H4 (9003,HB2) for 45 and 55W, H7, H11/H8/H9 for 45 and 55W, H13 (9008), H13(9008) for 45 and 55W, H15, 9004 (HB1), 9005(HB3)/H10(9145) for 45 and 55W, 9006(HB4) for 45 and 55W, and 9007 (HB5). Made of entirely aluminum for the external case of the bulbs, you are sure to get quality for YEARS to come. A world of a difference will be seen if you’re switching from any halogen, to these LED lights. Moving down to our #3 contestant, a cheaper alternative to a few of the LED headlight bulbs above is Ediors Three Sided LED Headlight Conversion Kit. Unlike the majority of its competitors, Ediors has LED lights on all 4 corners of its bulb (making it completely 360 degrees). With that being said, you’re getting a wider and brighter LED bulb for each headlight. Priced quite reasonably at around 70 dollars in total, this LED kit boasts 6000K of pure white light output (like most), and the electronics such as heatsink+ fan help to keep this set from overheating (all heat builds up in the back). 30,000 hours of guaranteed running time and a much greater light output are the main reasons why you should switch over. 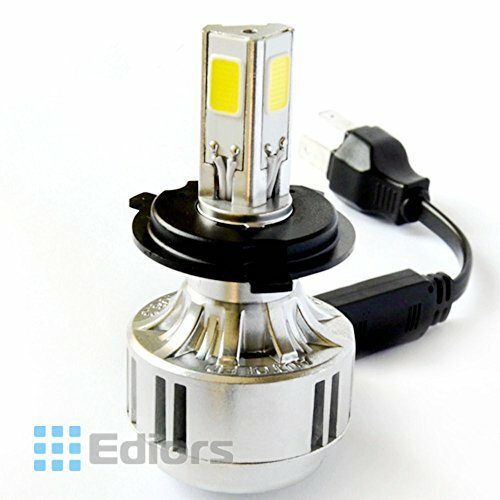 Current compatible sizes for the Ediors’ LED kit are: H1, H3, H4, H7, H8/H9/H11, 9004, 9005, 9006, and 9007. 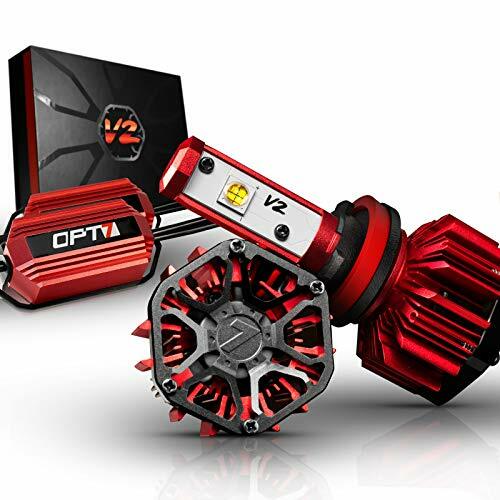 Currently as you’re reading this right now, the OPT7 LED Headlight Bulbs Kit are the best selling set of LED lights. These are constructed of aluminum outer shells for each of the bulbs, as well as the ECU to regulate output. Rated at around 6000K of bright white light, these bulbs should last well over 50,000 hours (that’s years of constant use). Whether you drive through rain or in extreme weather conditions, you’re 100% water+ weather proof with this set of LED headlight bulbs. In terms of compatibility, OPT7’s come in these sizes: H1, H3, H4 (9003), H7, H11, H13 (9008), 880, 9005 and 9006. Whether you drive a two door sports car, a family four-door car, or a pickup truck. In terms of compatibility, OPT7’s come in these sizes: H1, H3, H4 (9003), H7, H11, H13 (9008), 880, 9005 and 9006. 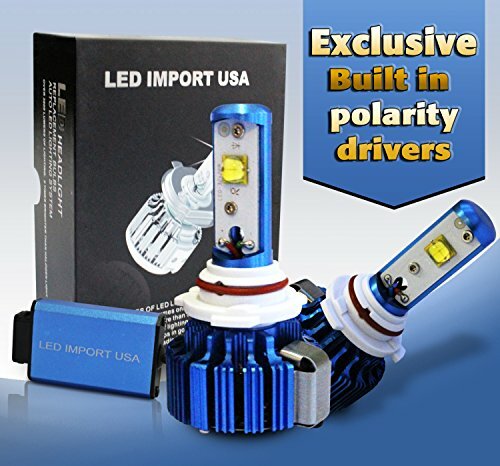 Whether you drive a two door sports car, a family four-door car or a pickup truck, upgrading to a set of LED powered headlight bulbs will be an obvious upgrade. Over 1,170 individual user reviews have given these bulbs an excellent rating. 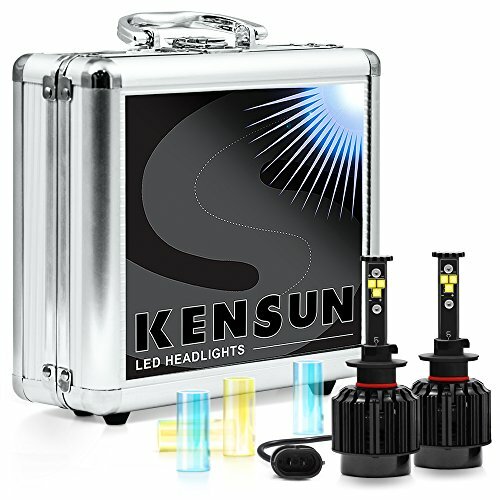 Our #1 pick for the best LED headlight conversion kit is Kensun All-In-One LED Headlight Bulb Kit. This kit comes in a aluminum briefcase which allows you to store them in a safe place where they can’t get harmed. Running on 30watts and with a life span of over 30,000 hours, it’s made possible by using the built-in heatsink and cooling fans. These lights produce nearly zero heat, so no internal wear from headlight heat should ever happen. Producing 6000K of ultra bright white light, you’ll notice right away the crystal clear and clean cut beam of light for each headlight. As an added bonus, each bulb includes a yellow and blue tint cover which will turn the ultra white light into a shade of blue or yellow (yellow being ideal for fog lights). Sizes come in: 5202, 880, 881, 9004 (HB1), 9005 (HB3), 9006 (HB4), 9007 (HB5), D1, D2, D3, D4, H1, H10, H11, H13 (9008), H3, H3C, H4 (HB2) (9003), H7, H8 and H9. Instead of spending 30 dollars for a set of 2 ordinary halogen bulbs, for an extra 40 dollars, you’re going to get YEARS of life from these LED bulbs + MUCH better coverage over the road. Like we stated earlier, the opposite side of LED headlights are Xenon HID headlights. Functioning just like halogen headlights, but the only difference is the light output. Also, over the years the prices for hid kits have dropped dramatically. A good kit won’t cost you any more than 80-100 dollars. Second guide we recommend you look into is the LED light bar guide, the types of LED lights you would mount to your truck or SUV’s front bumper and use for off-roading purposes. A very popular item is you own any type of off-road vehicle. With all these electronics using up electricity, we recommend you get yourself a high quality car battery. Factory batteries usually won’t last long and can’t handle a BIG load when you decide to upgrade to aftermarket electronics.